Closing Date for Submission extended to 28 Mar 2010 by popular request. 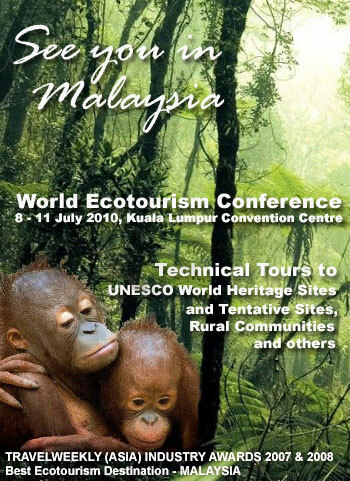 WEC2010 is pleased to announce the Call for Papers for its 2010 World Ecotourism Conference to be held in Kuala Lumpur from 8 - 11 July 2010. Closing Date for Submissions will be 28 February 2010. The WEC2010 is an international not-for-profit conference for that represents the global ecotourism fraternity; the private sector, governments, academia, NGOs, professionals and stakeholders who in one way or another plays a role in the development, implementation and study of ecotourism and its triple bottom line principles. 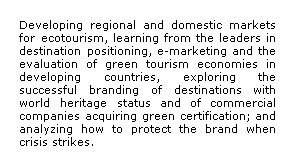 This is your opportunity to meet different sectors and sections of the ecotourism industry to exchange, share and work on our common ideas, issues and topics to reach desired goals for the betterment of nations and its people as well as nature and environment through ecotourism. 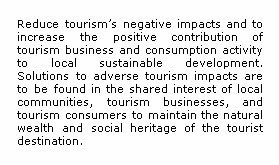 The conference outcome plays a catalytic role in supporting and transforming tourism policies, strategies and objectives of not only the host country but also the region and the industry at large. The selection of topics surround pertinent issues which require in-depth research, understanding and discussions of a wide range of related issues to improve the nations' economies and peoples' standard of living through sustainable tourism and the narrowing or reducing the divide, disparity, inequality and struggles of people, nature and environment on this planet. The above sub-themes should be considered when submitting a proposal. inspire those in the host country, region and the world. in what ways the proposal is relevant to members of the leisure industry. In response to conference feedback, high quality verbal presentations and interactive workshops are encouraged, particularly those that enable interaction with the audience. 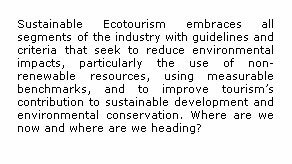 We need a diverse program which will stimulate thinking, showcase best practice, provide ideas and suggest solutions to ensure ecotourism continue to be responsive to the industry. A panel, consisting of 3 to 4 members, that explores a relevant theme/subtheme from a variety of perspectives. Panels provide an opportunity for a group of colleagues to present a range of interpretations, contrasting points of view, or different approaches to a particular topic. Each panel presenter is to talk for a maximum of 10 minutes. The session is moderated, ensuring plenty of time for discussion with session participants. Focus Forums is an opportunity for in-depth discussion about a relevant topic. These forums do not have presentations rather they are places for extensive discussion, deliberation, participation and action between the 1 - 3 experts. Submissions for forums should outline the discussion topic and make clear links to specific themes of the conference. Forums discussions will be 30 minutes long and will be facilitated by a skilled moderator who will ensure active participation and dialogue amongst participants. You will be notified of the success or otherwise of your presentation by 31 March 2010 . 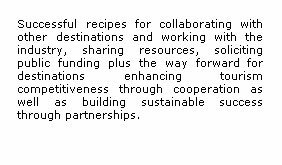 You will be notified of the success or otherwise of your submission by 31 March 2010 of which the proposal/abstract will be tentatively included in the Conference Programme. You will then have two (2) months to submit your completed paper/presentation ie by 28 May 2010 in order to be included in the final programme. Please note that all speakers are required to pay and register for the conference (early bird rate will be applied as a discounted benefit). • Applicants are permitted to submit and present one proposal. • Late proposals will only be considered should there still be spaces available in the program. Late proposals that have been accepted by the Conference Program Committee as meeting all of the requirements may be added to a waiting list. • If the Program Committee receives an excess of proposals, as occurred last year, priority will be given to those who did not present last year and those who have given high quality presentations in the past.